Payment technologies are very different than payment methods. MasterCard and Visa are payment methods that underwrite the credit that is being issued when you purchase goods with a typical credit card, versus a debit card which is guaranteed by the funds in your bank account. The plastic card with the ubiquitous magnetic stripe is the payment technology that is the most common in the US today. In 2015 the mag stripe payment technology will be replaced by EMV pin and chip technology. So all credit card processing terminals will need to be upgraded to accept EMV chip and pin credit cards in 2015 or the merchant will pay a fine for fraudulent credit card charges that result because of mag stripe payment technology. With Apple pay, MasterCard or Visa is still the payment method, and Apple Pay merely replaces the payment technology. For the consumer this is a no brainer, you merely use your iPhone or Apple Watch instead of your credit card. Everything else works the same. Driving some of these moves to a more secure payment technology is the upcoming change to EMV chip and PIN credit cards in the USA. By the summer of 2015 where all older style payment terminals will be replaced with the newer technology terminals. Apple pay uses biometrics (fingerprint technology) as well as NFC technologies creating a hyper secure platform, virtually eliminating in person credit card fraud. There are no cards to fumble with and the NFC (Near Field Contact) technology is a very reliable and secure data communication method. You also have he option to gracefully pay with another card If one card does’t fly. Its very easy to change cards an touch again with out the store clerk knowing what kind of card you are using. 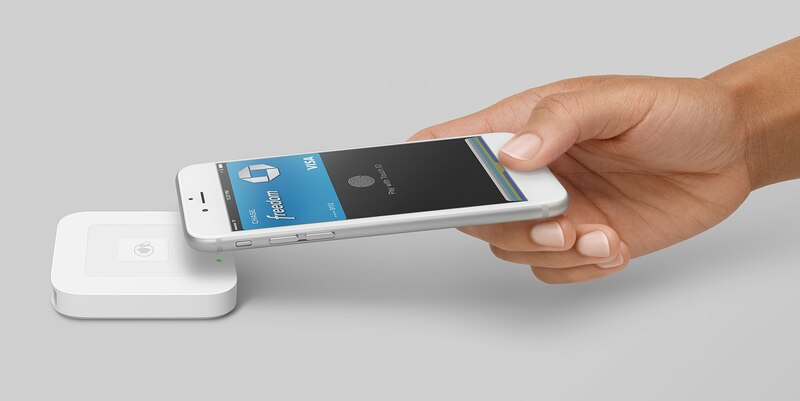 Both the iPhone 6, 6 plus, Apple Watch and even some Samsung phones have the capability to use Apple Pay at retailers that have decided to accept Apple Pay. Starbucks and most Grocery stores, except for Walmart ,are now EMV compatible and will only have to add a low cost NFC antenna to their terminals to become Apple Pay compatible. ALL retailers will be paying higher merchant fees if they haven’t converted to EMV or Apple pay by the summer of 2015. 6) Why should anyone want to use Apple Pay? Apple Pay reduces identity theft and Apple Pay lets you leave the plastic cards at home so they cannot be stolen out of your purse or wallet. 7) Why Apple Pay is better for you than CurrentC? CurrentC is a Walmart backed payment method meant to replace Visa and MasterCard. CurrentC is very insecure compared to Apple Pay using only a bar code that anyone can print at home in conjunction with a bar code scanner as a payment technology which is better than mag stripe technology but not anywhere as secure as Apple Pay. With Apple pay you get to keep your credit card perks, like points and discounts without risking the money in your checking account. Apple Pay also lets you keep you current spending power (credit limit) in case of emergencies or to get you through rough times.